Tsuburaya Mitsuhiko was a student in Teitan Elementary when Shinichi was enlisted into his class after he had been shrunk by the drug APTX 4869. Shortly afterwards, his classmates Ayumi and Genta had the idea of investigating an apparently haunted mansion, and they persuaded Conan to come along. When Mitsuhiko espressed his scepticism about supernatural hauntings, Genta forcefully 'persuaded' him to tag along as well. As it turned out, the haunting served as a cover-up for an old homicide case. Following its resolution, the foursome decided to stay together and form the nucleus of what would become the Detective Boys. It is later revealed that Mitsuhiko's parents are both teachers, and he has an older sister, Tsuburaya Asami, about ten years his senior. 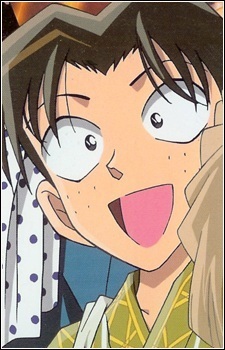 Mitsuhiko enjoys reading science books and takes a scientific approach to problem-solving. He is a smart and well-read first-grader who believes that technology can solve most problems. Due to his strict and formal upbringing, he tends to be very formal towards his elders, addressing them with the formal suffix "-san" without regard to the intimacy of their relationship. In nearly 800 episodes and counting of Detective Conan (Case Closed), Conan Edogawa has solved several kinds of mysteries. Find out more about the mysteries that Conan has solved over the years!